The National Security Agency’s assigned the “secret and below” certification for a self-encrypting, secure memory stick. The drive is the newest device in a portfolio of NSA-certified Exelis information assurance products offering secure data-at-rest, data-in-transit, communications, networking and storage solutions. 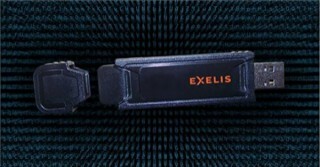 Exelis AARIS secure network processers are critical information assurance components in a range of applications, from storage media to communications hardware, where the security of information is a top priority. The modularity and programmability of the chips combined with Exelis expertise in the NSA certification process can significantly simplify and accelerate module design and certification for a wide variety of custom information assurance projects.